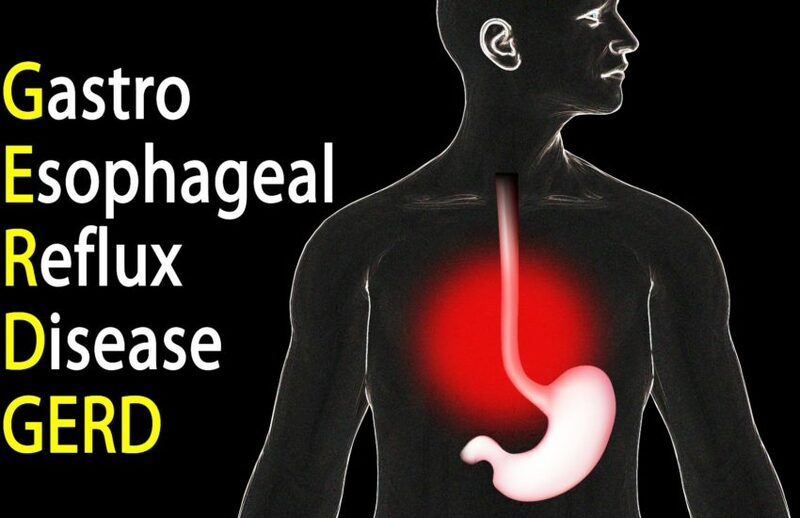 Gastroesophageal reflux disease (GERD)is the abnormal backflow of stomach acid up into the esophagus, the long, muscular tube that connects the back of the mouth to the stomach. The muscle at the border of the esophagus and stomach, called a sphincter, works as a barrier that is normally closed to prevent the contents of the stomach from washing up into the esophagus. It should open only when you swallow. Acid reflux occurs when this sphincter, or “gate,” opens at the wrong time or is too weak, allowing stomach contents to leak back (or reflux) into the esophagus. Some doctors believe a hiatal hernia may weaken the LES and increase the risk for gastroesophageal reflux. Hiatal hernia occurs when the upper part of the stomach moves up into the chest through a small opening in the diaphragm (diaphragmatic hiatus). The diaphragm is the muscle separating the abdomen from the chest. Recent studies show that the opening in the diaphragm helps support the lower end of the esophagus. Many people with a hiatal hernia will not have problems with heartburn or reflux. But having a hiatal hernia may allow stomach contents to reflux more easily into the esophagus. Coughing, vomiting, straining, or sudden physical exertion can cause increased pressure in the abdomen resulting in hiatal hernia. Obesity and pregnancy also contribute to this condition. Many otherwise healthy people age 50 and over have a small hiatal hernia. Although considered a condition of middle age, hiatal hernias affect people of all ages. Doctors recommend lifestyle and dietary changes for most people needing treatment for GERD. Treatment aims at decreasing the amount of reflux or reducing damage to the lining of the esophagus from refluxed materials. Avoiding foods and beverages that can weaken the LES is often recommended. These foods include chocolate, peppermint, fatty foods, coffee, and alcoholic beverages. Foods and beverages that can irritate a damaged esophageal lining, such as citrus fruits and juices, tomato products, and pepper, should also be avoided if they cause symptoms. Decreasing the size of portions at mealtime may also help control symptoms. Eating meals at least 2 to 3 hours before bedtime may lessen reflux by allowing the acid in the stomach to decrease and the stomach to empty partially. In addition, being overweight often worsens symptoms. Many overweight people find relief when they lose weight. Cigarette smoking weakens the LES. Stopping smoking is important to reduce GERD symptoms. Elevating the head of the bed on 6-inch blocks or sleeping on a specially designed wedge reduces heartburn by allowing gravity to minimize reflux of stomach contents into the esophagus. Do not use pillows to prop yourself up; that only increases pressure on the stomach. Along with lifestyle and diet changes, your doctor may recommend over-the-counter or prescription treatments. Antacids can help neutralize acid in the esophagus and stomach and stop heartburn. Many people find that nonprescription antacids provide temporary or partial relief. An antacid combined with a foaming agent helps some people. These compounds are believed to form a foam barrier on top of the stomach that prevents acid reflux from occurring. Long-term use of antacids, however, can result in side effects, including diarrhea, altered calcium metabolism (a change in the way the body breaks down and uses calcium), and buildup of magnesium in the body. Too much magnesium can be serious for patients with kidney disease. If antacids are needed for more than 2 weeks, a doctor should be consulted. For chronic reflux and heartburn, the doctor may recommend medications to reduce acid in the stomach. These medicines include H2 blockers, which inhibit acid secretion in the stomach. H2 blockers include: cimetidine(Tagamet), famotidine (Pepcid), nizatidine (Axid), and ranitidine (Zantac). Endoscopy is an important procedure for individuals with chronic GERD. By placing a small lighted tube with a tiny video camera on the end (endoscope) into the esophagus, the doctor may see inflammation or irritation of the tissue lining the esophagus (esophagitis). If the findings of the endoscopy are abnormal or questionable, biopsy(removing a small sample of tissue) from the lining of the esophagus may be helpful. An upper GI series may be performed during the early phase of testing. This test is a special X-ray that shows the esophagus, stomach, and duodenum (the upper part of the small intestine). While an upper GI series provides limited information about possible reflux, it is used to help rule out other diagnoses, such as peptic ulcers. Esophageal manometric and impedance studies — pressure measurements of the esophagus — occasionally help identify low pressure in the LES or abnormalities in esophageal muscle contraction. For patients in whom diagnosis is difficult, doctors may measure the acid levels inside the esophagus through pH testing. Testing pH monitors the acidity level of the esophagus and symptoms during meals, activity, and sleep. Newer techniques of long-term pH monitoring are improving diagnostic capability in this area. Sometimes GERD results in serious complications. Esophagitis can occur as a result of too much stomach acid in the esophagus. Esophagitis may cause esophageal bleeding or ulcers. In addition, a narrowing or stricture of the esophagus may occur from chronic scarring. Some people develop a condition known as Barrett’s esophagus. This condition can increase the risk of esophageal cancer. Dietary and lifestyle choices may contribute to GERD. Certain foods and beverages, including chocolate, peppermint, fried or fatty foods, coffee, or alcoholicbeverages, may trigger reflux and heartburn. Studies show that cigarette smoking relaxes the LES. Obesity and pregnancy can also play a role in GERD symptoms. The most common symptom people with GERD suffer is heartburn. Heartburn is pain or discomfort, sometimes described as burning, which rises from the stomach up into the chest. The discomfort often occurs after meals but can happen any time during the day, even waking you at night. Almost everyone experiences heartburn at some time, but frequent or persistent heartburn more than twice a week over several months is the hallmark of GERD. Approximately 10 to 20 percent of the U.S. population has some symptoms of GERD every day. Infants with GERD may fail to gain weight, may develop more slowly, may have recurrent respiratory problems, or may just be irritable. To understand the causes of GERD, it helps to understand the normal protective mechanisms involved in preventing acid from refluxing into the esophagus. The lower esophageal sphincter, the muscle at the border of the esophagus and stomach that works as a gate and prevents reflux, may open frequently or have a low pressure. Either can lead to reflux. A healthy esophagus should also be able to “clear” the acid through regular contractions, called “peristalsis,” and by neutralizing the acid with saliva. Additionally, the stomach must empty properly. If any of these mechanisms becomes altered or abnormal, acid can wash up into the esophagus and cause heartburn or other symptoms. Anything that increases the pressure on the stomach can contribute to GERD by overcoming the lower esophageal sphincter. However, certain other factors can also trigger GERD. For example, smoking causes the lower esophageal sphincter to relax, allowing stomach contents to wash back up into the esophagus and trigger GERD symptoms. Drinking alcohol and taking certain medications can also trigger symptoms. Pregnant women are particularly vulnerable to acid reflux. The symptoms typically get worse in the third trimester when the enlarged uterus pushes up on the stomach.Hormones during pregnancy also cause the digestive system to work more slowly and make the lower esophageal sphincter relax more often. Symptoms typically disappear after childbirth. Acid reflux is also more common in patients who have a hiatal hernia, which means the stomach’s normal position has shifted upward so that part of it is in the chest. Erosive esophagitis: This is severe inflammation of the lining of the esophagus. Esophageal ulcers: These are crater-like sores in the lining of the esophagus, which can bleed and may sometimes cause anemia (low red blood cell counts). Esophageal strictures: This is the narrowing of the esophagus caused by scar tissue, which can lead to difficulty swallowing and episodes of food being caught in the esophagus. Barrett’s esophagus: This is a condition in which the normal lining of the esophagus is replaced by abnormal cells. Approximately 10 to 15 percent of those with GERD develop Barrett’s esophagus. It is most commonly found in Caucasian men over age 50. Patients with Barrett’s also have a slightly increase d risk of esophageal cancer, so they should have an endoscopy every few years to check for signs of cancer. Reflux laryngitis: Inflammation of the voice box may occur when stomach acid spills into the trachea and irritates the vocal cords. This may lead to sore throat, chronic throat clearing or a hoarse voice. The relationship between reflux and laryngitis is not completely clear, so other causes of laryngitis such as allergies, smoking or postnasal drip should always be investigated . Respiratory complications: T These complications occur when stomach contents wash back up the esophagus and spill into the trachea and down into the lungs, or when stomach contents traveling into the esophagus cause a reflex of the bronchi(the small airways in the lungs) that may lead to wheezing, cough, worsening of asthma or infections like pneumonia. Dental erosions: Severe GERD can lead to an increased risk of tooth decay due to stomach acids wearing away the tooth enamel. Increased risk of cancer of the esophagus: People with severe and long-standing GERD have an increased risk of esophageal cancer, even when they don’t develop Barrett’s esophagus. Some diseases and conditions can present with similar symptoms to GERD. These include esophageal spasms, esophageal cancer, peptic ulcer disease, gastritis, asthma and coronary artery disease. There is an association between asthma and GERD, especially in those with wheezing that gets worse at night, when lying down or after meals, and in people with respiratory symptoms such as frequent coughing or hoarseness or recurrent pneumonia. According to the American Academy of Allergy, Asthma & Immunology, as many as 70 percent of people with asthma also have GERD. One of the most concerning symptoms and conditions that might be confused with GERD is chest pain due to heart disease. The question arises: Is it heartburn or heart attack? There are some differences. The classic description of cardiac chest pain is crushing, heavy or dull pain below the sternum (chest bone) that may extend up to the neck, shoulders or arms, and shortness of breath. The pain is usually relieved with nitroglycerin. The chest pain with GERD is typically burning and may extend upward. Pain due to GERD usually occurs after meals and is often relieved by antacids. However, the pain can be so similar to that of chest pain that it is often difficult or impossible to distinguish between the two without sophisticated testing. NOTE: The symptoms of chest pain that accompany a heart attack are notoriously inconsistent with the classic description, especially in women, who often develop atypical pain, such as abdominal or back pain. As opposed to heart disease, pain from GERD should not go to the back, shoulders or arms. However, the absence of these symptoms does NOT eliminate heart problems as the cause. If pain lasts for more than few minutes, do not try to diagnose yourself; seek immediate medical attention. Many people with gastroesophageal reflux disease (GERD) go undiagnosed for years because they don’t consider their symptoms serious or they are able to treat the symptoms with common over-the-counter medications. Although rarely life threatening, frequent heartburn and other GERD-related symptoms can cause significant limitations in daily life and may lead to more significant complications, such as erosive esophagitis and Barrett’s esophagus. Early diagnosis is important, not only for symptom relief, but to prevent long-term complications. For the following questions describe your symptoms as never, rarely, once or twice a week, frequently, more than once a day. Does heartburn interfere with normal activities or sleep? Does your heartburn cause severe pain that makes you unable to perform normal activities or sleep? Have you experienced difficult or painful swallowing? Have you experienced persistent coughing? Have you experienced hoarseness or scratchy throat? Have you had trouble breathing or wheezing? How often do you take an antacid or over-the-counter medication for your symptoms? Next, your health care professional conducts a physical exam, evaluating your mouth, teeth and throat for signs of redness, swelling or dental erosions. A lung exam may also be performed to listen for wheezing or other abnormal breath sounds, and a heart and abdominal exam may be given to check for masses, tenderness, abnormal sounds or heartbeats or abnormal collections of fluids, and to evaluate the size of your liver. Many times, your health care professional gets enough information from your history (your symptoms) and your physical examination to make either a firm or probable diagnosis of GERD without any other tests. Usually when this is the case, medications can be started immediately. If your symptoms get much better with these medications, then it is very likely that your symptoms are due to GERD. Laboratory tests. While there is no lab test or blood marker specifically for GERD, some people require laboratory tests to rule out other causes for their symptoms, such as blood tests for anemia, liver function, kidney function or cardiac enzymes (used to check if there has been any damage to the heart). Endoscopy. In this test, you receive a mild sedative, and a lighted flexible tube, called an endoscope, is passed through your mouth into your esophagus and down into your stomach. This allows your health care practitioner to visually check for inflammation and ulcers of the esophagus and stomach and for other abnormalities such as bleeding, narrowing of the esophagus and scarring. Most people with heartburn have a normal endoscopy, but it is important to perform the test in some people to look for more extensive damage to the esophagus. Endoscopy also allows your doctor to take biopsies (small samples of the lining of the esophagus). Endoscopic biopsies are the only reliable way to diagnose Barrett’s esophagus, a complication of GERD. pH monitoring. During this test, a catheter (a very thin tube) is passed through the nose and into the bottom of the esophagus to measure acid reflux over 24 hours as you go through your normal activities. The catheter is attached to a small device that measures the amount of acid that reaches the esophagus. Wireless systems of measuring gastroesophageal reflux are also available. Instead of wearing a catheter for 24 hours, a small device about the size of a gel cap is attached to the esophagus, and pH measurements are transmitted via radio waves to a pager-sized receiver on your belt. This system, called the Bravo esophageal pH test, allows prolonged (48 hour) monitoring. The capsule detaches within 7 to 10 days and passes on its own in the stool. Even though this system eliminates the discomfort of wearing the tubes in the nose, the procedure requires an endoscopy to place the device, and some people may notice the capsule and complain of chest pain, problems swallowing or painful swallowing. Esophageal impedance testing. To measure the movement of the contents in your esophagus, your health care professional may order esophageal impedance testing, which involves placing a catheter through your nose and into your esophagus. If your doctor orders this test, it is usually combined with the pH monitoring test so that only one catheter is in your esophagus. This test is different from the pH monitoring test because it does not rely on the acidity of the stomach contents. This test can determine if stomach contents reflux into the esophagus even if they are not acid, making it useful for figuring out if there are nonacidic substances, like bile or ingested food and liquids, backing up into the esophagus. Esophageal manometry. During this test, a special tube is passed into the esophagus to measure both the muscle function during swallowing and the function of the lower esophageal sphincter. This test is not adequate for diagnosing reflux but is sometimes recommended if you’re having trouble swallowing. It is usually reserved for patients who have an unclear diagnosis after other testing or for whom surgery is being considered. Upper gastrointestinal x-ray series. During this test, you drink a liquid contrast solution. As you swallow the liquid, x-rays are taken. This test doesn’t diagnose GERD, but it can diagnose a hiatal hernia, narrowing of the esophagus or tumors obstructing the esophagus. Gastroesophageal reflux disease (GERD), although common, is often unrecognized and thus is left untreated, self-treated or treated incorrectly. This is unfortunate because GERD usually responds well to appropriate management. GERD is treated in steps. By working closely with your health care professional, finding the right course of action can lead to an improved quality of life. For mild cases, those with infrequent symptoms, you may only need to change your diet and avoid certain activities and over-the-counter medications. For more persistent symptoms, such as daily heartburn or symptoms that occur at night, you may need a prescription medication. Anti-reflux surgery can be a reasonable alternative to a lifetime of medication and discomfort, especially if the condition is caught when you’re relatively young. Surgery may also be considered when medications cannot control the reflux. However, newer medications are available that are very effective at controlling GERD. When symptoms are still bothersome despite these strong medications, it is likely that the symptoms are due to other problems besides only GERD. Many gastroenterologists and surgeons no longer recommend surgery in this situation, because the symptoms often remain even after the surgery. The cornerstone for all GERD treatments begins with lifestyle changes. The key to these changes requires understanding what triggers and activities are contributing to your symptoms. Avoid foods and drinks that trigger relaxations of the lower esophageal sphincter, such as mints, chocolate and alcohol. Lose weight if you are overweight. Obesity may contribute to GERD because the extra weight increases the pressure on your stomach and the lower esophageal sphincter, allowing reflux. Avoid lying down after eating a meal or snack for at least two to three hours. Go for a walk after a meal. Not only will this help prevent GERD symptoms, but it also burns extra calories. Avoid common food triggers such as fatty or fried foods, like fried chicken, cream sauces, mayonnaise or ice cream. Other problem foods to avoid include coffee, tea, sodas, citrus fruits and tomatoes. These foods relax the lower esophageal sphincter muscle, allowing stomach contents to wash back up, or their acidity can irritate the lining of the esophagus. Stop smoking. Smoking damages the digestive system and, some studies find, relaxes the lower esophageal sphincter. Smoking may also reduce the amount of bicarbonate in saliva, thus reducing its ability to protect the esophagus from stomach acid. However, some nicotine replacement therapies (nicotine patch, nicotine gum) can cause indigestion, stomach pain and vomiting. Discuss possible side effects of these products with your health care professional before using them. Avoid tight clothing around your abdomen, such as girdles, tight jeans and elastic waistbands, which can increase pressure on your stomach and lower esophageal sphincter. Elevate the head of your bed six to eight inches or sleep on a wedge pillow to help gravity move the acid reflux back into the stomach. Don’t bend over after eating. Instead, bend at your knees if you have to pick something up, and avoid exercises that require you to bend at your waist. Additionally, avoid exercising after a heavy meal. Check your medications. Certain medications may make your symptoms worse. These include theophylline, calcium channel blockers, alpha blockers and beta blockers, and anticholinergic drugs, which can be present in medications used to treat Parkinson’s, asthma and certain over-the-counter cold preparations. If you think a medication you’re taking might be contributing to your symptoms, check with your health care professional about alternatives, but do not discontinue any prescribed treatment without first discussing the risks of stopping therapy. Your health care professional may want to treat your GERD with medications. Because GERD is often a chronic problem, you may have to take these drugs for the rest of your life, but some people only need them for a short time. Be patient; finding the right medication and dosing schedules may take time. If symptoms persist while taking medication or if they return after you stop taking them, consult your health care professional. If symptoms of GERD occur during pregnancy, consult with your obstetrician before taking any medications. These products can help with mild and infrequent symptoms. They work by neutralizing stomach acid. Antacids are typically fast-acting and can be taken as needed. Because they also are short acting, they don’t prevent heartburn and are less useful for frequent symptoms. Most antacids contain either calcium carbonate (such as Tums, Rolaids, Mylanta and Maalox) or magnesium hydroxide (Phillips Milk of Magnesia). Sodium bicarbonate, also known as baking soda, can relieve heartburn and indigestion. It should always be mixed with at least 4 ounces of water and taken one to two hours after meals, not on an overly full stomach. Talk to your health care provider about using it. Do not use it for more than two weeks, and do not give it to children under 12 years old, unless your health care provider tells you to. Another type of antacid contains alginate or alginic acid (such as Gaviscon). This antacid has the additional benefit of blocking liquid from coming back up into the esophagus. Antacids can interfere with how well your body absorbs other medications, so if you are taking any medications, check with your health care professional before you start using antacids. Ideally, you should take the antacid at least two to four hours after you take other medications to reduce the chance it won’t be fully absorbed. People with high blood pressure should avoid antacids with high amounts of sodium, such as Gaviscon. Finally, antacids are not a good option to heal erosive esophagitis, which should be treated with other medications. These drugs work by decreasing the amount of acid your stomach produces and are available in both prescription and over-the-counter (OTC) doses. Typically, the prescription form is the same medication, just in a larger dose, and may benefit some people who can’t find relief with over-the-counter preparations. Combining an acid reducer and lifestyle changes often helps. There are two types of acid reducers: “H2-blockers” and proton pump inhibitors (PPIs). Both are available in OTC and prescription versions. All H2-blockers and a few PPIs are also sold as generic drugs. Your health care professional will likely first try an OTC drug for a few weeks and then move to a prescription-strength version if the OTC medication doesn’t appear to be working. Pepcid Complete is a combination medication, with both the OTC dose of famotidine and the antacids calcium carbonate and magnesium hydroxide. Proton pump inhibitors are also acid reducers but are much more powerful than the H2-blockers. Proton pump inhibitors (PPIs) are the most commonly prescribed class of medications for treating heartburn and acid reflux disease. These drugs work by blocking acid production in the cells lining the stomach and significantly reduce the amount of stomach acid. They don’t work as quickly as antacids, but they can prevent reflux symptoms for many hours. People with liver conditions should consult their physicians before taking these drugs. Prokinetic agen ts such as metoclopramide (Reglan, Metozolv ODT) work by tightening the lower esophageal sphincter, which helps prevent acid from washing back up into the esophagus. They also slightly increase the contractions of the esophagus and the stomach to help empty the stomach faster. These medications can be useful as additional therapy in some people with GERD but shouldn’t be used alone. Also, side effects, such as fatigue, depression, anxiety and other neurological problems, limit the usefulness of these drugs. Surgery is considered an alternative to medical therapy for GERD. The best candidates for surgery are young patients (because they would otherwise require long-term treatment) with typical GERD symptoms (heartburn and regurgitation) who respond to medical therapy but who are seeking alternatives to taking daily medications. Those with unusual symptoms or symptoms that don’t respond to medication should only consider surgery if there is no doubt about the diagnosis of GERD, and there is a clearly documented link between symptoms and reflux based on testing. Fundoplication is the most common surgery used. This surgery reinforces the lower esophageal sphincter by wrapping the top of the stomach around the lower esophageal sphincter. Nowadays, this surgery can usually be done with minimally invasive (laparoscopic) techniques, instead of the traditional “open” manner. One advantage of fundoplication is that a hiatal hernia can be corrected at the same time. Surgery is not always successful, and many patients still require some medication. The outcome of this procedure is usually good, but complications can occur, including difficulty swallowing, bloating and gas, a breakdown of the surgical repair and diarrhea that results from injury to nerve endings that lead to the stomach and intestines. Bending over and other exercises that squeeze your abdomen, and exercising on a full stomach. Wearing tight clothing around your waist, such elastic waistbands and girdles, that can increase the pressure on your stomach. Lying down after a meal. If you are flat on your back after a large meal, it’s easier for your stomach contents to wash back up into your esophagus. For this same reason, no late-night snacks just before going to sleep. And elevate the head of your bed six to eight inches to aid gravity in keeping acid in your stomach, where it belongs, while you’re sleeping. Eating large meals. Large amounts of food in the stomach put more pressure on the lower esophageal sphincter, causing it to remain open. Stop smoking and avoid tobacco products. Smoking causes relaxation of the lower esophageal sphincter and may reduce the amount of acid-neutralizing saliva in the mouth and throat, resulting in damage to the esophagus. Avoid foods that trigger symptoms such as citrus foods, tomato sauces, peppermints, chocolate, onions, coffee, fried foods and carbonated beverages. Avoid drinking alcoholic beverages. Alcohol can relax the lower esophageal sphincter and cause erratic contractions of the esophagus that can allow acid to reflux into the esophagus and cause heartburn. Check your medications. Some medications may make your symptoms worse. But don’t stop taking any without first consulting your health care professional. Common drugs that might have these effects include drugs to treat asthma and emphysema such as theophylline; anticholinergic drugs used to treat Parkinson’s disease and asthma and found in some over-the-counter cold medications; some calcium-channel blockers, alpha-blockers and beta-blockers used to treat heart conditions or high blood pressure; certain drugs that affect the central nervous system; and iron tablets. While some drugs make GERD symptoms worse, others can cause pill esophagitis, a condition that results in symptoms similar to GERD but is not actually due to reflux. Pill esophagitis occurs when the pill is swallowed but doesn’t make it from the esophagus to the stomach because it gets stuck on the esophagus wall. This burns the lining of the esophagus, causing chest pain, pain when swallowing and esophageal ulcers. Medications associated with pill esophagitis include aspirin, nonsteroidal anti-inflammatory drugs (NSAIDs) such as ibuprofen (Motrin) and naproxen (Aleve), alendronate (Fosamax), potassium and some antibiotics (especially tetracycline or doxycycline). Heartburn is a common symptom caused by the refluxing of stomach acid into the esophagus. In some people, the acid damages the esophageal lining, a condition called erosive esophagitis. The lower esophageal sphincter is normally closed after a meal. When this sphincter relaxes (opens) inappropriately it allows stomach contents to wash back up into the esophagus. The most common symptoms of GERD include heartburn and an acidic or sour taste in the mouth (known as acid regurgitation). Other symptoms that might be caused by GERD include hoarse voice, wheezing, sore throat, coughing, fullness in throat, difficulty swallowing and chest pain. Symptoms of GERD affect about 10 to 20 percent of the population on a daily basis. Children, men and women can all be affected by GERD. GERD is a chronic condition, but for most sufferers this condition can be treated satisfactorily with lifestyle changes and medications. When left untreated, GERD can cause significant conditions such as ulcers, inflammation of the esophagus, bleeding, lung problems and damaged teeth. GERD can also cause a precancerous condition called Barrett’s esophagus. This occurs in approximately 10 to 15 percent of patients. Men develop Barrett’s esophagus twice as often as women do. Most people with Barrett’s don’t develop cancer, but because of increased risk, should undergo surveillance with endoscopy every two to three years. Certain medications and foods may worsen GERD by causing relaxation of the lower esophageal sphincter. Smoking weakens the lower esophageal sphincter allowing acid to reflux into the esophagus. Chest pain should never be assumed to be just heartburn but should always be considered a possible sign of a heart condition such as a myocardial infarction, also known as a heart attack. What is GERD?Gastroesophageal reflux disease (GERD) is a condition where stomach acid washes back up into the esophagus, the long muscular tube connecting the back of your throat with your stomach. What are the most common symptoms of GERD?The most common symptoms are heartburn, which is the burning discomfort that rises up from the stomach into the chest, and acid regurgitation, which is the feeling of bitter or sour taste material into the mouth when stomach contents wash back up into the mouth. I had heartburn after I ate Thanksgiving dinner. Do I have GERD?Virtually everyone experiences heartburn at some point, especially after very large fatty meals. GERD is typically diagnosed when heartburn occurs more than twice a week over a period of several weeks or if frequent heartburn disrupts your daily life. I just take antacids and, usually, my symptoms go away. Why should I consider another medication?Antacids are good for occasional symptoms, but recurrent or persistent symptoms could indicate more serious problems. Other medications, such as proton pump inhibitors and H2-blockers, are highly effective, can prevent symptoms from occurring and can heal esophageal inflammation. If you have frequent heartburn, discuss it with your health care professional. What causes GERD?Gastroesophageal reflux disease (GERD) is the abnormal backflow of stomach acid up into the esophagus, the long, muscular tube that connects the back of the mouth to the stomach. The muscle at the border of the esophagus and stomach is called the sphincter. It works as a gate, normally closed to prevent reflux but temporarily opening after you swallow to allow passage of food contents into the stomach. Acid reflux occurs when this sphincter or “gate” opens at the wrong time or is too weak, allowing stomach contents to leak back (or reflux) into the esophagus. Certain foods and medications can cause promote reflux by causing relaxations or low pressure in this sphincter or “gate.”Acid reflux is more common in people with a hiatal hernia, in which the stomach’s normal position has shifted upward so part of it is in the chest .The most common symptom people with GERD suffer is heartburn. If the reflux persists, the lining of the esophagus is damaged and can result in esophageal erosions, ulcers, inflammation or more significant changes, such as a condition called Barrett’s esophagus. Can children have GERD?Yes. Even infants can have GERD. Erosive esophagitis. This is the chronic inflammation of the lining of the esophagus. Esophageal ulcers. These are small crater-like areas in the lining of the esophagus. They may bleed and can be painful. Esophageal narrowing. Scarring of the esophagus causes this condition. If narrowing occurs, swallowing may become difficult and painful. Barrett’s esophagus. This is a condition where the cells lining the esophagus have become abnormal. It can be a precancerous condition in some people. Although the risk of cancer is low, it requires surveillance by endoscopy every two to three years. Laryngitis. This symptom may be caused by stomach acid causing inflammation of the vocal cords. The relationship between reflux and laryngitis is not completely clear. Other causes, such as allergies, smoking or postnasal drip, should be investigated. Lung problems, such as recurrent pneumonia, wheezing and asthma. Theoretically, these conditions may occur when stomach contents wash back up the esophagus and spill into the trachea and down into the lungs or when stomach contents traveling into the esophagus cause a bronchial reflex. Tooth decay. This condition is caused by stomach acid wearing away the enamel on the teeth. I’ve been told I have a hiatal hernia. What is that?A hiatal hernia develops when part of the stomach protrudes up through the diaphragm (the muscular layer between the abdomen and the chest) and into the chest. Heartburn is a common problem associated with a hiatal hernia. Not all patients with hiatal hernia have GERD, and many GERD patients don’t have a hiatal hernia. Can GERD cause cancer?Chronic GERD can damage the esophagus and lead to a condition called Barrett’s esophagus. Those with Barrett’s esophagus do have a significantly increased risk of cancer of the esophagus. Only endoscopic biopsy can reliably diagnose Barrett’s esophagus. Also, there appears to be an increase in cancer of the esophagus even if Barrett’s esophagus has not developed. Can GERD be cured?No. But with adherence to lifestyle changes and taking medication, the symptoms can usually be easily treated. In some conditions, like pregnancy, GERD will go away on its own after delivery. Surgery does not cure GERD, but the fundoplication wraps part of the stomach around the lower end of the esophagus to prevent acid from refluxing. I have been diagnosed with GERD. What symptoms should I look for? Will I have to have any diagnostic tests to determine if I have GERD?Most people can be diagnosed based on their symptoms and the response to treatment. Diagnostic tests are sometimes ordered for those with severe or persistent symptoms or to determine if there is another cause of the symptoms.